In terms of its overall landscape and the holiday makers attracted, Ibiza is one of the most unusual of the Balearic Islands and its most popular hotels front the endless selection of beaches. Party-goers will also find more than enough accommodation within a stone's throw of Ibiza's famed nightlife, bars and clubs. Those who crave a more traditional and tranquil holiday experience will likely prefer lodging at the more secluded towns and villages within the island's interior, around Sant Rafel and Santa Gertrudis de Fruitera. 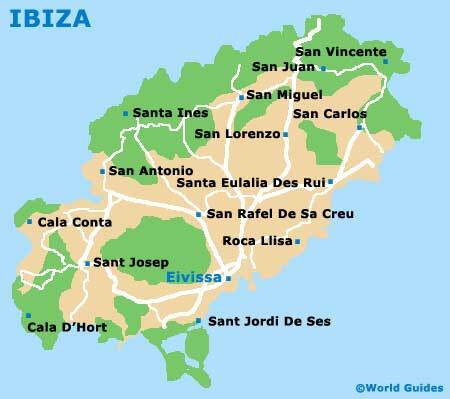 However, if you are searching for the action, then the southerly Ibiza Town (Eivissa) is really the place to look for hotels, with accommodation being clustered around D'Alt Vila, Sa Penya and the portside Sa Marina, as well as the nearby beaches of Platja de Figueretes and Ses Salines. When booking accommodation on Ibiza, do bear in mind that the high season falls between the middle of June and September, and at this time, hotels are at their most expensive. This is particularly so in August, the busiest month. Outside of the summer season, lodging can drop by as much as a third, although even with these discounts, hotels on Ibiza are rarely what could be described as cheap.